• For quantitative determination of reduced glutathione (GSH) and evaluation of drug effects on glutathione metabolism. • Sensitive and accurate. Linear detection range 0.4 - 100 μM in 96-well plate. • Simple and convenient. The procedure involves mixing the DTNB Reagent with sample, removing protein precipitates for proteinaceous samples, adding a second Reagent and reading the optical density. • Low interference. Amino acids and common buffers do not interfere. • Glutathione is a tripeptide of glycine, glutamic acid and cysteine. In the red blood cell, the reduced form of glutathione is vital in maintaining hemoglobin in a reduced state and hence protecting the cells from oxidative damage. Glutathione is involved in detoxification of hydrogen peroxide through glutathione oxidase. 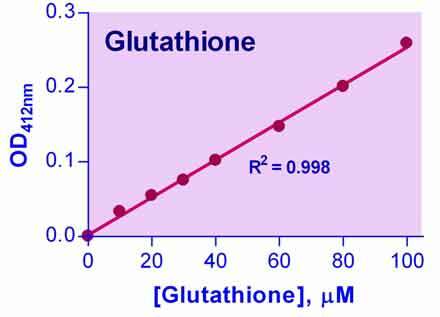 Low levels of glutathione are found in deficiencies of key enzymes involved in glutathione metabolism, such as glucose-6-phosphate dehydrogenase, glutathione synthase and glutathione reductase. Simple, direct and automation-ready procedures for measuring reduced glutathione are becoming popular in Research and Drug Discovery. BioAssay Systems QuantiChrom™ Glutathione Assay Kit is designed to accurately measure reduced glutathione in biological samples. The improved 5,5’-dithiobis(2-nitrobenzoic acid (DTNB) method combines deproteination and detection (Reagent A) into one reagent. DTNB reacts with reduced glutathione to form a yellow product. The optical density, measured at 412 nm, is directly proportional to glutathione concentration in the sample. The optimized formulation has a long shelf life and is completely free of interference due to sample turbidity. 1. We would like to know if the QuantiChrom glutathione assay kit ref: DIGT-250 can be used to detect glutathione in wine. We tested a few wine samples (red and white) with our DIGT-250 kit. Unfortunately, the wine gave too high of a background at 412 nm and the glutathione levels are too low in wine for dilution of the sample to work. Therefore, we cannot recommend using this kit for glutathione determination in wine. 2. The protocol does not mention sample collection methods (i.e. whether it requires special preservatives, stabilizers etc.). What are your recommendations? We recommend processing serum samples immediately and avoiding prolonged storage. Rapid acidification is required to prevent GSH auto-oxidation, GSH and GSSG degradation, as well as to precipitate proteins that interfere with analysis. Although we have not validated it, we believe the processed samples should be stable at -80°C. 1. Ogunrinu TA, Sontheimer H (2010). Hypoxia increases the dependence of glioma cells on glutathione. J Biol Chem. 285(48):37716-24 Assay: glioma cells in human (Pubmed). 2. Park, MS et al (2010). Korean Red Ginseng Protects Oxidative Injury Caused by Lead Poisoning. JGR 34(2):132-137. Assay: blood in rat (PDF). 3. Gumpricht E, et al (2008). Resistance of young rat hepatic mitochondria to bile acid-induced permeability transition: potential role of alpha-tocopherol. Pediatr Res. 64(5):498-504 Assay: mitochondrial GSH in rat (Pubmed). 4. Kaur C, et al (2010). Melatonin protects periventricular white matter from damage due to hypoxia. J Pineal Res. 48(3):185-93 Assay: brain tissue in rat (Pubmed). 5. Labib, HM, et al (2010). The Role of Oxidative Stress Markers and Nitric Oxide Levels in the Pathogenesis of Glaucoma. Austr. J. Basic and Applied Sci 4(8): 3553-3558. Assay: blood in human (PDF). 6. Malek, HA et al (2015). The preventive effect of beta-3 adrenoceptor stimulation against experimentally induced reflux esophagitis. Acta Physiologica Hungarica. 102(1): 94-104. Assay: plasma in rat (Pubmed). 7. Barros, MA et al (2015). L-Alanyl-Glutamine Attenuates Oxidative Stress in Liver Transplantation Patients. Transplantation Proceedings. 47(8):2478-82. Assay: Liver Tissue in Human (Pubmed). 8. Yun, J et al (2015). Bergenin decreases the morphine-induced physical dependence via antioxidative activity in mice. Archives of Pharmacal Research. 38(6):1248-1254. Assay: Brain and Liver Tissue in Mice (Pubmed). 9. Suh, KS et al (2016). Protective effects of honokiol against methylglyoxal-inducedosteoblast damage. Chemico-Biological Interactions. 244:169-177. Assay: Cells in Plant extract (Pubmed). 10. Mesci, P et al (2015). System xC- is a mediator of microglial function and its deletion slows symptoms in amyotrophic lateral sclerosis mice. Brain. 138(Pt 1):53-68. Assay: Spinal Cord tissue in Mice (Pubmed).